On 16 November 1977, Matheson issued an Early Warning Synopsis, providing a plot outline of Destiny and booking studio recording time.13 Edgar adapted the play for television. He now recalls that he made it “more naturalistic in some ways: we lost Paul and Tony’s out-front scene-setting in the scene in Turner’s antiques shop, and we cut the picket scene from the stage version, which was out front descriptive.” He retained the “little verses which brought the main four characters back from India” and put the play “in event-chronological order (the Hitler party scene followed the Turner antique shop scene on stage).” He also added incidents such as the one in which Turner appears at the late Colonel Chandler’s door with a wreath and is given new dialogue signifying his hierarchical deference: “My old commanding officer…”14 Certain characters from the play were omitted from the television version: the Police Inspector, the middle-aged French Canadian far-rightist Drumont, and the Tory candidate’s wife, Emma Crosby.15 Other changes include characters who are partly or wholly new to the television version, such as left-wing barroom agitator Don Matthews (Roderick Smith) and the Party Secretary (Rolf Day). 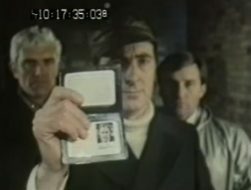 After 2-3 weeks of rehearsals in the BBC Rehearsal Rooms at Action, the studio recording of Destiny ran for three days, between Tuesday 13 December-15 December 1977, in TC6 at BBC Television Centre.48 Following camera rehearsals (17 scheduled hours across the three days), the recording took place from 7.30-10pm each evening,49 onto two-inch videotape with a feed from at least four cameras.50 Matheson explains that a vision mixer selected each shot live as they recorded, so editing options were at a minimum, with time spent using two-inch machines being “expensive and at a premium”.51 As far as Matheson can recall, it was made on budget, though she feels any higher costs were likely balanced out with a “less demanding” production.52 In addition to the multi-camera video material, there were film sequences listed in the camera script: Chandler’s funeral (which is described as “Remembrance Day”), Rolfe sitting in the train and the penultimate scene of the fight. Production documentation refers to the television play as an “Epic Drama”. On 1 February, the day after Destiny was broadcast, an advert for the Anti-Nazi League appeared in the Guardian: “Did you see David Edgar’s play ‘Destiny’ on BBC Television last night? The National Front are emerging as a growing force in British politics.”63 Under the headline “NEVER AGAIN” and featuring an image of children in a Nazi concentration camp in 1943, the two-month-old Anti-Nazi League appealed for donations and offered supporters “posters, stickers and leaflets”. The piece concluded by listing “over 400” League sponsors, who included prominent figures in British culture such as Dave Allen, Melvyn Bragg, Brian Clough, Glenda Jackson, Miriam Karlin, George Melly, Warren Mitchell, Michael Parkinson, Arthur Scargill, Tom Stoppard, Terry Venables and David Edgar. On the same day as the ANL’s advertisement was published, Destiny was discussed at a meeting of the Television Weekly Programme Review Board. DPA David Webster and Head of Plays James Cellan Jones agreed that it had been “very well done”.64 Webster commented that the play’s complexity suited its subject and “what had been interesting was the fair way in which the different strands of political thought had been represented.” Monica Sims, Head of Children’s Programmes, said that “it had really required a lot of concentration, but she had got caught up in it.” Sims expressed interest in its “rhetorical, poetical language in a setting of realism; this was something that one was not so used to on television as one was in a certain type of stage play.” Slim Wilkinson, veteran sports producer and Assistant Head of Outside Broadcasts, suggested that “the first half of the play had not been sufficiently bigoted.” James Cellan Jones countered by saying “it had been designed to be watched carefully all through” and also singled out Joseph Blatchley as having been “very much at his best” in the part of Maxwell. The reception from television critics was more mixed than the reaction from BBC management and critics of the theatre version. In The Guardian, Nancy Banks-Smith commented that it was helped by its context following the Thatcher speech on ITV, but felt that “still looked and sounded” like a stage play that had not been successfully translated to its new medium.71 She found it “sententious” and “slow”; although she felt it had a “solemn power and pain”, she professed herself “not enthused”, finding amusement in the non-naturalistic dialogue: “At no point was it possible to have a pint without someone bursting into impassioned oratory at the bar and someone else taking your pint pot for a silver collection. Or for two toughs to share a cell without breaking into political counterpoint.”72 In The Observer, Melvyn Bragg also commented that its “timing” the day after Thatcher’s comments on This Week gave the play much “impact”.73 Bragg pinpointed what he saw as the play’s limitations: its concern being with 1930s parallels and too little with “the Britain of the 1970s”; for example, in Edgar’s presentation of the deal between National Forward and British big businessmen as a conscious echo of Hitler and the Ruhr barons. While Bragg acclaimed the play’s “admirable moral fervour”, he was concerned about how Edgar’s “documentary” influenced style is combined with speculation and how it takes liberties with the contemporary political situation and twists “known facts”. 2 June 2017: minor typographical corrections and standardisation; specific correction resulting in ‘ANL’s advertisement’. 14 July 2017: one minor typographical correction; corrected coding errors that obstructed weblinks; standardisation of endnotes by completing first names in one citation; punctuation standardisation. Visit Tom May’s British Cold War Culture blog here.